32 suites will be added to the island’s hotel room stock through Mt Cinnamon Resort’s new development and expansion project. Owner and Developer Peter de Savary, and Minister for Implementation Hon. 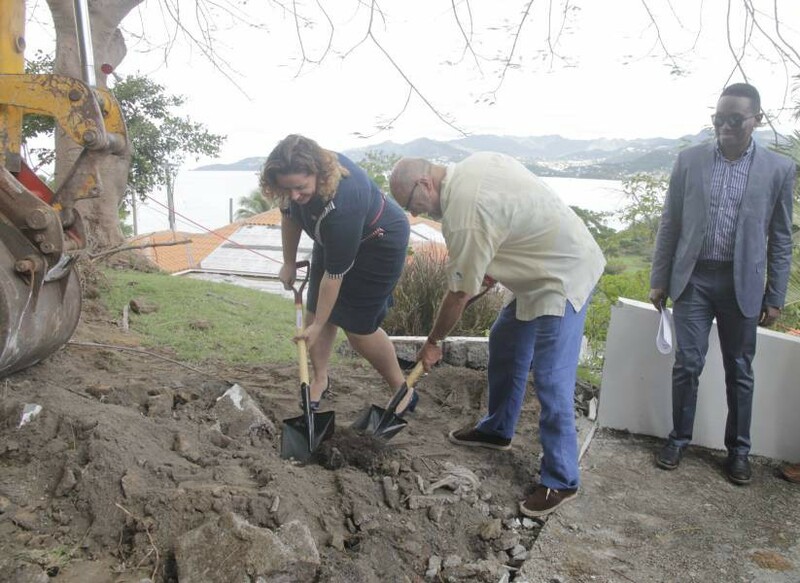 Alexandra Otway–Noel, turned the sod on the expansion site on Wednesday, marking the official commencement of the project. With the first condominiums due to be completed in the 2016/2017 winter season, Mr de Savary says construction begins now. “The Architects and the builder are instructed to move forward as quickly as possible. In the coming days there will be a lot of activities as it pertains to the initial work continuing from there” Mr de Savary said. The EC$67 million project will more than double the size of the resort, and will include additional and improved hotel amenities, furnishings, landscaping and infrastructure, among other benefits. The overall expansion is also expected to create 75 construction jobs and 45 new permanent jobs. Minister Otway–Noel commended Mr de Savary for the venture and thanked him for the various tourism contributions he has made to the island, including introduction of the concept of residential hotels. “I want to, on behalf of the Government wish you the very best as you build up the next phase of this beautiful project, and know that we are there to continue supporting you in whatever way we can, and thank you so much for all that you have done for us, for the many jobs you have created and continue to create, and for building us the beautiful, luxury property residential property that we have on our menu of hotels. We are very proud of it”, Minister Otway–Noel said.